Are you one of many Americans bothered by submental fullness, sometimes referred to as “double chin”? This common problem, which is sometimes related to aging, may also be the result of weight gain, or inherited through your DNA. It usually does not disappear no matter how much you diet or exercise. For years the only effective treatment was surgery; either face and neck lift, or liposuction. We now have a simple, FDA-approved solution with Kybella™ for our patients in the Boston area. This submental fullness treatment is safe, non-invasive, highly effective and long lasting. 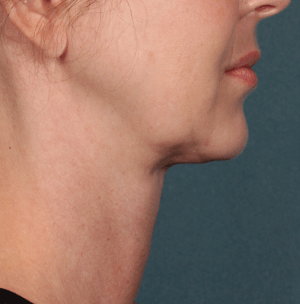 How does Kybella™ work to improve submental fullness? Kybella™ treatment involves a series of tiny injections, and takes about 15 minutes. The active ingredient in the treatment is deoxycholic acid, a naturally occurring molecule in the body that aids in the breakdown and absorption of dietary fat. The treatment not only reduces submental fullness, but also visibly improves the contouring of the chin profile. After being treated with Kybella™ patients report improvement in self-perception, and nearly ninety percent of those treated are delighted with the results. Treatments are performed once every eight weeks until the desired effect is achieved. Most individuals require between two and four treatments. After injection into the fat beneath your chin Kybella™ permanently destroys unwanted fat cells. Once removed, these cells cannot store or accumulate fat. After the aesthetic goal is achieved, retreatment is not expected. The double-chin reduction procedure is very well tolerated. In the FDA trials performed across the country, involving dermatologists from SkinCare Physicians, results were very impressive. Side effects were mild and temporary. Mild bruising, swelling, numbness, and a bit of tenderness, were the most common. There were no serious or significant long lasting side effects. If you’re looking for a solution for “double chin” in and around Boston, Kybella™ injections from one of our talented team of medical professionals can help renew your youthful appearance and reduce submental fullness. Request a consultation online, or contact us at (617) 731-1600 to schedule your appointment. 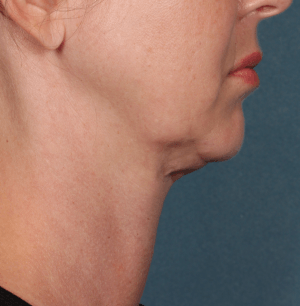 What does the double-chin reduction procedure involve? Kybella™ is given in a 15 to 20 minutes in-office treatment. The area will first be cleansed, marked out, and then anesthetized with a few almost painless injections of lidocaine anesthetic. The Kybella™ injections are nearly painless. Your SkinCare Physicians dermatologist will inject Kybella™ into the area in 10 to 30 sites. The benefit takes between four and eight weeks to appear. Slowly but surely, after a series of between 2 to 4 treatments, the striking benefit becomes very noticeable. The number of injections and the number of treatments is determined by how much submental fullness you have. A small dressing is applied after the procedure for 1 to 2 days to limit swelling and bruising. Because swelling is not uncommon, it’s important to have at least one or two days free in your schedule after these treatments. Swelling may last 1 to 2 weeks but in most individuals it is mild and short lived. Exceptional results are possible with advanced treatments and technology. Kybella™ results are durable and long-lasting, and retreatment is not expected. After each treatment fat is destroyed and does not reappear. But it takes a series of 2 to 4 treatments, performed once every eight weeks, to get a pleasing result. Over 2000 subjects were enrolled in the FDA trials, including many who were treated by dermatologists at SkinCare Physicians. Side effects of swelling, bruising, discomfort, numbness and tingling were the most common and usually lasted only a few days to a few weeks. All the side effects were mild and none were long-lasting. How will I look after my Kybella™ treatment? Immediately after treatment, you will experience a little bit of swelling and redness, and occasionally some bruising. As fat cells are destroyed over 4 to 8 weeks, you will notice gradual reduction in submental fullness. Most patients see improvements after the first treatment, but a series of 2 to 4 injection sessions are needed to achieve the best possible long lasting results. At SkinCare Physicians, our doctors and staff are highly experienced with Kybella™ as a non-surgical option to improve submental fullness or double chin. Get started, request a consultation online.